Get Access | Join Now And Get Your Keys To The Foot Care Vault ! And that's hard on the feet. We needed Better gear so we created Foots Love. This is an amazing product. 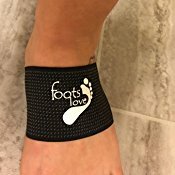 I have been dealing with a hammer toe for a long time and Foots Love Toe Straightener is really helping to bring it back to normal. It is comfortable to wear and does just like what it claims. I wear while lounging around the house a few times a week and I do feel the difference. My toes and nails are staring to realign. Looking forward to see how straight I can get my toes! 100% recommended! Don't let Arch pain slow you down. Get back to it Faster with Infused Copper Healing. Straighten, Pad and Comfort with the Power of Better. You asked for it .. Your library of Videos, Downloadable Ebooks and relevant articles all things Foot Care. 15 % Off Membership Monthly Gift Cards, Product Giveaways And More. Join Today!